This is what Education Secretary Betsy DeVos said, according to the Dallas Morning News, about striking Oklahoma teachers while she was visiting Dallas last week: “I think about the kids. I think we need to stay focused on what’s right for kids. And I hope that adults would keep adult disagreements and disputes in a separate place, and serve the students that are there to be served.” What DeVos described as a disagreement and a dispute (and a squabble in a Feb. 27 tweet about the West Virginia teachers’ strike) is a walkout by teachers affecting most districts in Oklahoma. That walkout is supported, not so incidentally, by the superintendent of the Tulsa Public Schools. Educators are demanding reasonable salaries and more funding for public schools. Oklahoma’s walkout was called April 2 by teachers (not the union) who say they don’t have the tools to serve their students well and, as DeVos said, “stay focused on what’s right for kids.” So what is right for kids? When Eugenio Villa agreed to return to the Inglewood schools for a second tour last summer, he knew the district remained one of California’s most troubled. Inglewood Unified had been nearly insolvent when it was taken over by the state Department of Education in 2012. Six years later, its enrollment was still declining. Its school buildings were tired — some edging into decrepitude. Its test scores and graduation rates were still below the state average. And the public was out of patience. Still, Villa, who had signed back on as the district’s chief business official, was shocked at what he found when he arrived in June 2017. Two years earlier, he had left the school system on what he thought was firm ground. “Embattled Inglewood Unified School District finally balances the books,” read a 2015 headline in the Daily Breeze. But it had all been wiped away. The district was staring at an $8.1-million budget shortfall brought on by a series of major errors in revenue and spending projections that, in retrospect, had little connection to reality. By Villa’s estimate, Inglewood was about a year away from running out of cash. How do I assess my students’ civic learning? Major reforms like the Common Core State Standards and the College, Career, and Civic Life (C3) Framework highlight the need for new assessments that can speak to the authentic tasks that are often at the heart of high quality civic education. While those educating for democracy frequently engage their students in work that includes action projects, presenting about civic issues, and writing about controversial topics, it can be challenging to find systematic methods for assessing this work. Fortunately, innovative organizations, districts, and states have begun developing some methods. Take a look at the materials on this page to learn about various ways to assess your students’ civic learning. Arizona students protected under the Deferred Action for Childhood Arrivals program will no longer be eligible for in-state college tuition, the state Supreme Court ruled Monday. The 7-0 ruling upheld an earlier decision in the Court of Appeals last year that said DACA recipients, often called DREAMers, who have been granted “lawful status” but not “legal status” do not qualify to pay resident rates. Monday’s decision will affect more than 2,000 students enrolled in Arizona’s community colleges and three public universities. The fee changes will take effect immediately and in some cases more than triple the annual cost of attendance. The Associated Press estimated community college students who currently pay $2,580 a year will now pay $8,900. Four-year universities will charge DACA students who graduated from a state high school 150 percent of in-state tuition. That will increase annual costs from about $10,000 to $15,000. Those who do not meet the requirement could pay up to $27,618, according to AZ Central. Arizona DACA students are also ineligible for federal or state financial aid. The Texas Board of Education on Wednesday gave preliminary approval to creating statewide academic standards for a Mexican-American studies high school course — but only after changing the name to “ethnic studies,” which conservatives argued is less alienating for other groups of people. The issue has been hotly debated for years in a state that was once part of Mexico and where a majority of public school students are Hispanic. The vote was a small but key victory for supporters of including more in classrooms about the contributions of Mexican-Americans throughout Texas’ history, but the name change reflects how contentious that remains. The Republican-controlled board voted to begin working on a statewide curriculum for a course known as “Ethnic Studies: An Overview of Americans of Mexican Descent.” A final vote is set for Friday. Four years earlier, the same board refused to approve a full, statewide Mexican-American course. Texas’ 1,000-plus school districts were instead allowed to create their own, and many did, including a course offered by schools in Houston, the country’s seventh largest school district. As 3-year-old Foster takes a break from zooming around the carpet with his new car, his mom scoops him up to read. Surrounded by stacks of books at the Central Library, Lauren Child starts reading one that’s all about trains. “This train travels by …” she reads, pausing. “Night!” Foster chimes in. He’s eager to fill in blanks and discuss the illustrations as they go. They read like this a lot. Child’s mother was a school teacher, so she knew reading was important and read to her son while she was pregnant. Now, they read three books each night as part of their bedtime routine. “It’s surprising how much he picks up from reading,” said Child, “and it’s really impressive.” According to a study out Monday in the journal Pediatrics, he’s picking up a lot more than language. The new research suggests that when parents and caregivers read aloud and play with children from birth, there are long-term benefits for how they develop socially and emotionally. “Reading and play really does change the way your child approaches their feelings, their behavior and, ultimately, their readiness to learn when they get to school,” said Alan Mendelsohn, associate professor of pediatrics and population health at New York University Langone Health. Jami Amo can relate to the grief and trauma students at Marjory Stoneman Douglas High School are feeling after a mass shooting there in February. And she can also anticipate some difficult life experiences they will likely face as their grief and memories age with them. Every time Amo meets a new person, there comes a point when they ask where she grew up, and she knows a difficult conversation is about to begin. Amo was a freshman at Columbine High School outside of Littleton, Colo., in 1999, when two students planted explosive devices there and shot and killed 12 students and a teacher. A simple “where are you from?” conversation can quickly take her back to that day. It’s something she wants students at Stoneman Douglas to be prepared for. “People say ‘Oh, I’m so sorry,’ and I never know what to say,” Amo said. “Why do people apologize? It’s not their fault. Do they feel bad that we weren’t the only ones? That it didn’t stop with us?” Amo is one of about 115 Columbine survivors who’ve signed up to be pen pals with Stoneman Douglas survivors. Organized through networks and Facebook groups for survivors of gun violence, the Columbine alums have also recruited a few of their former teachers to correspond with faculty of the Parkland, Fla., high school. “We want to show them not that there’s a specific road map, but there is a way forward,” Amo said. Since the shooting massacre at Marjory Stoneman Douglas High School, there have been calls for adding guns at U.S. schools. On the outskirts of San Antonio, Texas, one district has their own school police force, with more than 100 officers covering 117 schools. Special correspondent Lisa Stark of Education Week reports on how schools are grappling with security for worst-case scenarios. Starting next year, Los Angeles Unified School District officials will consider asthma rates and injuries from gun violence in neighborhoods near its campuses to help decide which district schools are most in need of extra funding. And those are among nearly a dozen new factors L.A. Unified officials will use to rank schools by their level of student need. Among the new metrics: graduation rates, test scores, how many fights a school sees and even how well incoming students fared academically in their old schools. L.A. Unified school board voted unanimously Tuesday night to add these factors and others to its “Student Equity Needs Index,” a formula it has used to divvy up a relatively small portion of its overall budget to around 780 schools across the district since 2014. The re-written index — “SENI 2.0,” as its backers called it — still takes into account whether that school serves high numbers of low-income students, foster youth and English learners. Those three groups of students all generate extra funding for L.A. Unified under California’s school funding law — and that law nominally requires districts to use that extra funding to pay for new services for those students. But the vast majority of L.A. Unified students fit into at least one of these three groups. For years, activist groups — most of them from South and East L.A. — have sought a re-write to the district’s formula, saying L.A. Unified officials need to meaningfully differentiate needy schools from the neediest schools, and target funding to those schools more carefully. (One group even sued the district over concerns the neediest students were being shortchanged; the case was recently settled.) Hence the desire to include new metrics that might illustrate more vividly the level of student need in a school — such as measures of asthma cases and gun injuries in neighborhoods around the school. Led by strong scores in 8th-grade reading, California moved closer to the national averages in reading and math, continuing a decade-plus trend of generally slow but steady improvement on the National Assessment of Educational Progress. The closely watched assessment released its 2017 results for 4th and 8th grades on Tuesday. California was one of seven states with a 4-point increase in 8th-grade reading, enabling it to come within 3 points of the national average on a 500-point scale. In 2007, it was 10 points below the average of the 50 states and Washington, D.C. The results show it moved to nearly 5 points in 8th-grade math and about 5 points in 4th-grade reading, having halved the distance from average in the past decade in both tests. The nation’s 1-point gain in 8th-grade reading was the only increase, though small, in the 2017 assessments. California progressed slightly in 4th-grade reading and in 8th-grade math since 2013, while the national average has stood still or dropped slightly. In 4th-grade math there has there been no progress in California or the nation. Since 2005, the average nationally and in California has stagnated. California continues to lag the national average. On her ranch far from the high-powered fiberoptic connections of major cities, Traci Glasscock was frustrated. An English teacher at Custer County’s public high school, Glasscock wanted to take college courses to give herself more career options. But she was too far from her nearest college and didn’t have the internet bandwidth needed to take classes online. So she gave up. Distance and technology hinder the college aspirations of a surprising number of rural Americans. About 3 million adults live more than 25 miles from a college or university and lack the sufficient internet speeds to take online courses, the Urban Institute reported in February. While that’s only 1.3 percent of the nation’s population, nearly 12 percent of Native Americans and indigenous Alaskans live in these so-called education deserts, the institute found. That makes them 16 percentage points less likely to attend college than Americans who live close to college campuses, and even less likely to complete it — by 18 percentage points. A lawsuit brought on behalf of schoolchildren in the most remote Native American community in the United States is addressing an emerging question in public education — namely, are school districts required to provide disability services to children who’ve suffered trauma related to poverty and discrimination. U.S. District Judge Steven P. Logan last week denied a request by the federal government to dismiss most of the case involving children at the Havasupai Elementary School, which is located on the floor of the Grand Canyon in Arizona. The complaint alleges that the Bureau of Indian Education (BIE) and other federal agencies have failed to provide the children with even the most basic education — including health and wellness services. In his ruling, Logan said the plaintiffs “have adequately alleged that complex trauma and adversity can result in physiological effects constituting a physical impairment.” “This ruling is a long overdue step toward reckoning with the legacy of oppression that has stained this nation’s consciousness,” said Kathryn Eidmann, a senior attorney for Public Counsel, a Los Angeles-based public interest law firm. Educational inequality is an “existential threat” to goals of the advancement of society, former U.S. Secretary of Education John King said in Memphis on Tuesday. King spoke during a panel at University of Memphis on “The Promise of Education” in the run-up to the 50th anniversary of the assassination of Dr. Martin Luther King Jr. That educational inequality, King said, is tied to the economic inequality that plagues cities like Memphis. Joining King were Dorsey Hopson, Shelby County Schools superintendent, Karen Harrell, vice president of early childhood services at Porter-Leath, and Walter Kimbrough, Dillard University president. In the 50 years since 1968 — when Brown vs. Board of Education, the landmark ruling calling for the desegregation of schools, existed in law but rarely in practice — too little has changed in Memphis or across the country, the panelists said. “We have seen real progress around high school graduation rates, which is encouraging, but too many of those children graduate without really being prepared for what’s next,” King said. Hopson highlighted the poverty and trauma that plague so many Shelby County students. Of the 112,000 students in the school district, he said, about 40,000 live in homes that make less than $10,000 a year. In 1996, right after voters in California banned affirmative action in employment and college admissions, minority student enrollment at two and four-year institutions plummeted. What has happened since though, is pretty remarkable. Of the 2.8 million students attending college in California today, two out of three come from racially and ethnically diverse populations. The most eye-popping increase in enrollment has been among Latinos. They now make up 43 percent of all college students in California. Twenty-six percent are white, followed by Asian and Pacific Islanders at 16 percent and African Americans at 6 percent. Business, education and civil rights groups agree these numbers are encouraging and have far-reaching implications for California’s workforce and economy. But there’s a problem. Among faculty and people in leadership positions, women, Latinos, blacks and Asians are still poorly represented and now, a new study is sounding the alarm. It’s titled, “Left Out: How Exclusion in California Colleges and Universities Hurts Our Values, Our Students and Our Economy”. I sat down Michele Siqueiros, who co-authored the report and heads the non-profit Campaign for College Opportunity to dig deeper into the numbers. 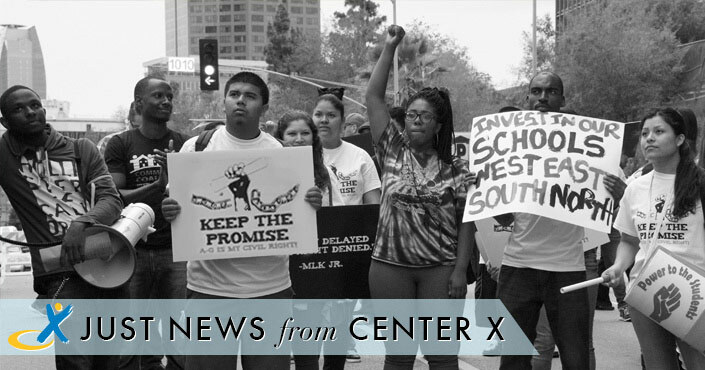 A charter schools advocacy group last week announced that it would end two long-running lawsuits in which it was seeking more classroom space and construction money from the Los Angeles school district. The decision, the California Charter Schools Assn. said, reflects better relations between charter schools and the L.A. Unified School District. But the move also suggests that the litigation, which already contributed to significant gains for area charters, was unlikely to produce much more. “It takes time, money and effort to litigate,” said Ricardo Soto, general counsel for the charter group. “Maybe it’s better to see if we can find the time and opportunity for collaboration.” Privately run charters are exempt from union contracts and some rules that govern traditional schools. L.A. Unified has 224 independent charters, more than any other system, enrolling about 18% of district students. Finding locations to operate is one of the most difficult challenges charters face. Under California law, charters with at least 80 students who live within district boundaries are entitled to facilities deemed “reasonably equivalent” to the public school system where they are located. In 2007, the charter association first sued for greater access to classrooms and other space on L.A. campuses. That led to a settlement under which the nation’s second-largest school system pledged to do better. Two years later, the association sued again — alleging the district was not doing enough. A consortium of groups representing military veterans and branches of the armed forces have a message for Congress: Don’t turn a popular federal education program into vouchers. In an April 5 letter to lawmakers, the Military Coalition said converting Impact Aid, a line item in the U.S. Department of Education’s budget designed to mitigate the impact of federal activities on school districts, into funding for education savings accounts “would be financially devastating for many school districts, critically compromising the quality of the education they could provide to military children and their civilian classmates.” The coalition is pushing back on the Education Savings Accounts for Military Families Act, which was introduced last month by Rep. Jim Banks, R-Ind. Banks’ bill would convert a “small portion” of Impact Aid’s $1.3 billion to ESAs, which families could use on private school tuition, tutoring, and other education costs—the exact amount of Impact Aid funding that would be directed to ESAs would depend on how many families choose to sign up for the accounts. When Donald Trump signed the spending bill two weeks ago, he did so reluctantly. The bill did not include funding for his much-promised border wall, an oversight he said made him consider vetoing it. Yet, in the end, the $1.3 trillion spending bill was palatable to him because it did include a $1.6 billion increase to border security funding—money that will mostly go toward increased surveillance technology. Most Americans probably do not think much about these technologies, but they have been increasingly a reality of life at the border since 9/11, when Customs and Border Protection (CBP) was folded into the newly created Department of Homeland Security (DHS). Border security used to be about undocumented immigration and drug smuggling. Now the border is a central theater of national security. But blurring the distinction between home and abroad does not erase the border—quite the opposite, it expands it.